This September Hotpod Yoga, Europe’s Largest Yoga Business, is offering 20-minute power classes to time-strapped city workers at One New Change in a bid to supercharge themselves and their work day. The classes have been created in a bid to combat sedentary whilst simultaneously providing a time-efficient way for office professionals to reach a physical and performance high. 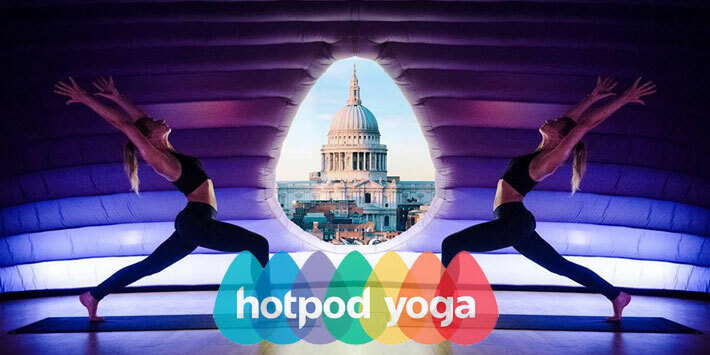 For those who are time-starved and spend their weeks slouched over desks or eyeballing computer screens, Hotpod Yoga’s residency at One New Change in the City of London has been designed to offer a prescription to burnt-out office workers, not only conditioning the body to be stronger but also revitalising and energising the mind. Classes take place inside Hotpod Yoga’s innovative, inflatable pods that are heated at 37 degrees to help melt you deeper into your practice. The heat supercharges your experience by rapidly warming your muscles and heightening the levels of fresh oxygen around your body. On leaving the pod, yoga-goers can head to the nearby Grange Hotel, where they will have access to the hotel’s Ajala spa, inclusive of shower and sauna facilities as well as discounted treatments. Exclusive discounts from One New Change retailers will also be available following both breakfast and lunchtime classes for workers wishing to ‘refuel’ back at their desks. Address: 1 New Change, London, EC4M 9AF • Location of the pod: The inflated pod will be located on the Lower Ground Floor, which is accessible via lift, escalator or staircase from the ground floor. It is located next to Superdry if facing St Paul’s’ Cathedral.